Consergra, S.L. is a Spanish company established in 1969. 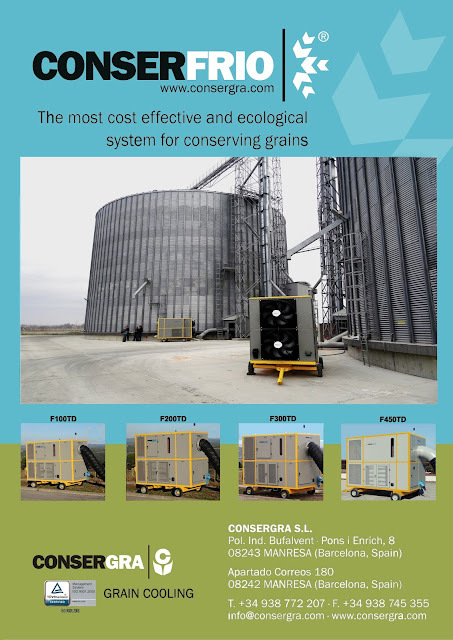 Since then, their main activity is the construction of special refrigeration and air conditioning units, mainly used for the preservation of grains, oil seeds and perishable granulated products. Other refrigerating and air conditioning units for different purposes are also produced according to customer needs. Throughout all these years, they have much experience in grain conservation by chilling, even under the hardest conditions of the desert or the tropics. Their units combine modern design, highest possible energy efficiency, reliability, and friendly use. They are designed for heavy duty operation. Their wide know-how together with a continued cooperation and feedback from customers, allow them to developed new solutions and make better machines over time. They also supply different equipment related to the grain industry: high quality grain moisture meters, portable low cost moisture meters, on-floor chilling ducts, under-floor chilling ducts.